This is a picture I had taken back in early August. The picture was taken at approximately 12 o'clock. As you can see, it stays shaded for most of the day. 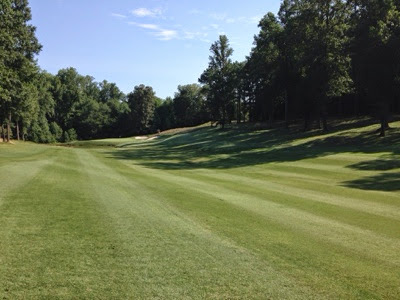 During the afternoon this pattern goes away by 3 o'clock, it starts to receive shade from the left side of the fairway. 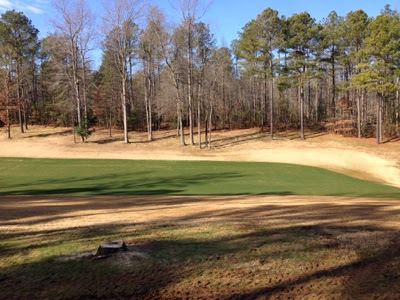 Growing Bermuda grass is the shade is hard enough but transitioning rye grass to Bermudagrass in the shade is almost impossible. After the fight we had last year it was time to make some changes to allow the turf to become stronger and provide a better playing area. 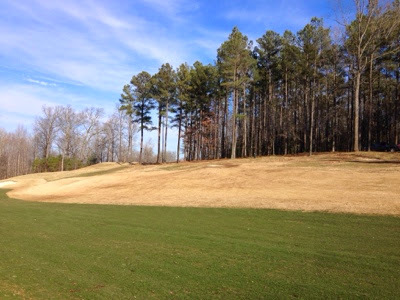 Here is a picture before we starting cutting the trees, looking up into the fescue area to the right of the fairway. 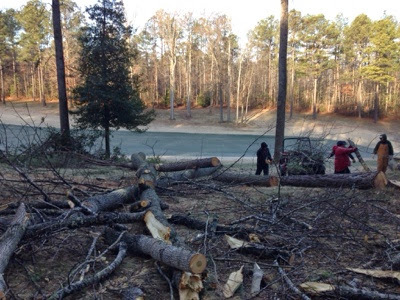 The staff is hard at work cutting down trees and removing the debris from the site. 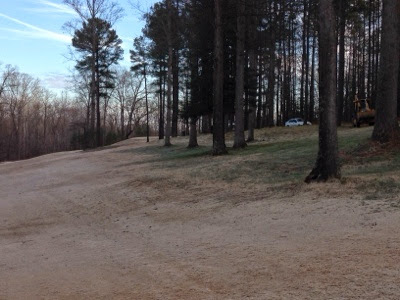 Here is a picture of the landing area where we are going to get more sunlight to. We have cut down several trees but we have more to go as you can still see some shadows. This is about 9 o'clock. Here is the area after it has been cleaned up. It has taken approximately 260 man hours to remove trees and clean up the area.